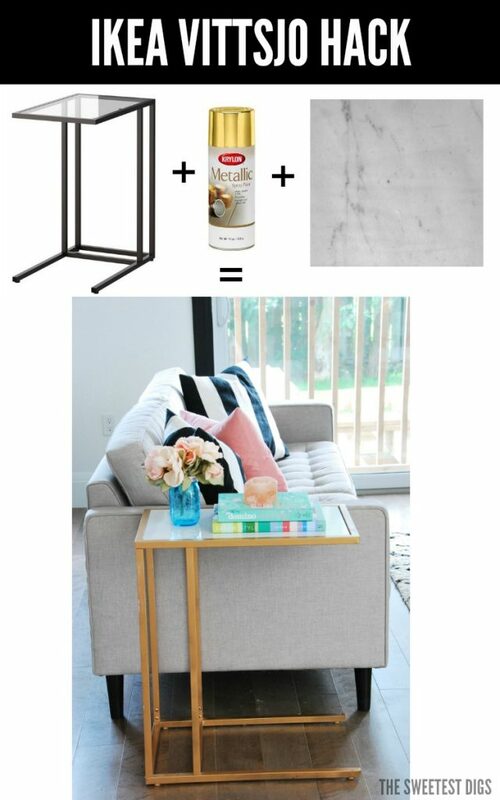 Guys, I have a seriously good IKEA hack for you today. Probably my favourite ever. I actually did this project a little while ago and hadn’t photographed it properly until yesterday… but here she is! 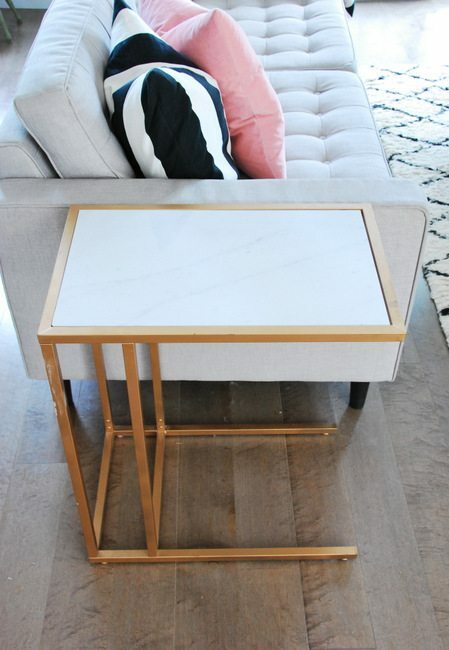 The IKEA Vittsjo hack into a glam gold and marble table. It is easy to do and ridiculously gorge. 1 // The Vittsjo table from IKEA. It retails for about $25, but I happened to get mine in the scratch and dent section for only $16, so keep your eyes peeled in there. 2 // Gold spray paint. 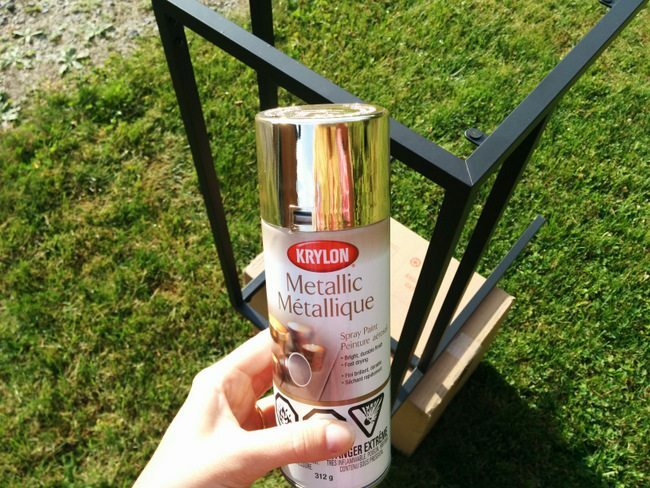 My absolute fave is this Krylon gold spray paint. 3 // “Instant Granite” in Italian White Marble. 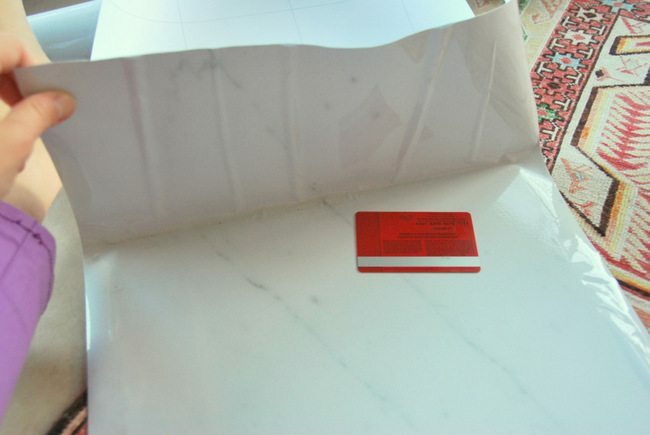 This stuff is a peel and stick paper – not the cheapest one out there, but the quality is good and the marbling looks very real (especially compared to some dollar store papers I came across). I searched a bunch of these on Amazon, read a ton of reviews, and ultimately settled on this brand. I was super happy, so definitely recommend it! 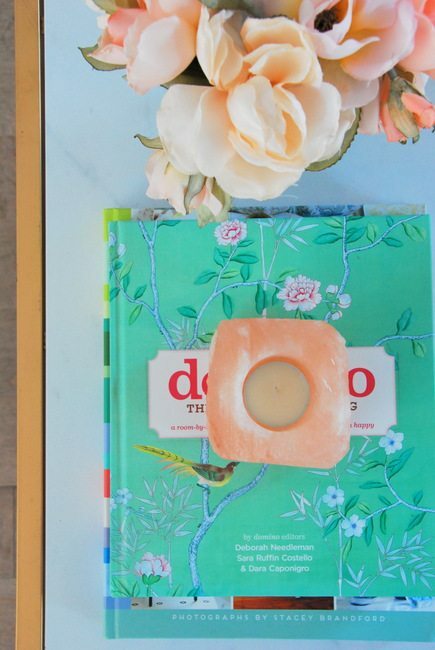 Start off by assembling your table and then spraying it gold. Remember the cardinal rule of spray paint: thin and even coats. Don’t try to do it all in 2 coats, as you will get drips. 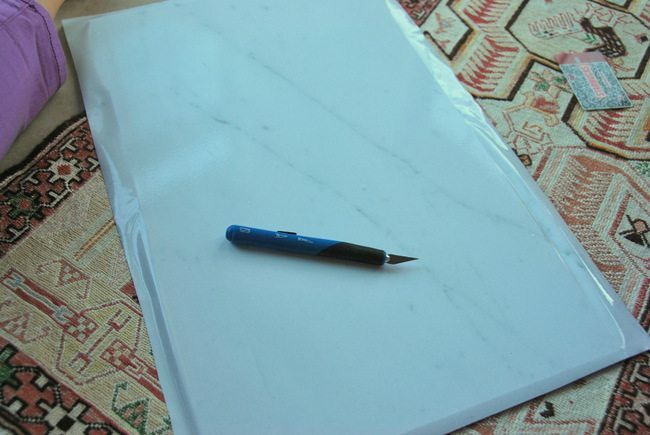 While that’s drying, get out your Instant Granite marble paper and glass top piece. 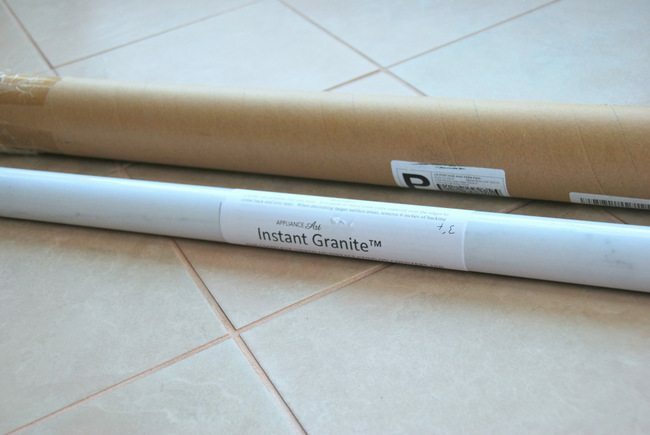 The paper comes in a tube and there is plenty in the roll for a few different projects (I have tons left over!). 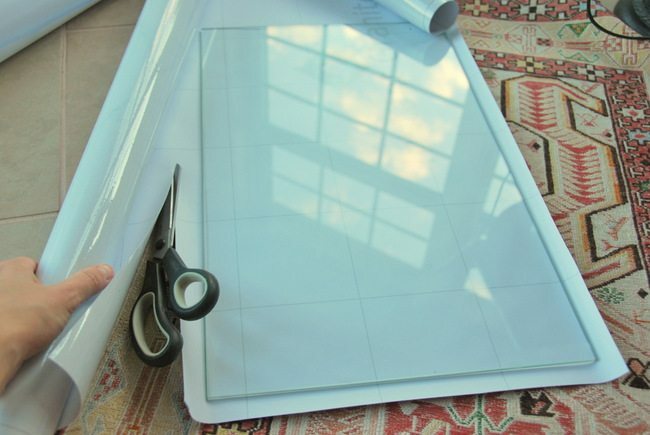 You want to roll out some of your paper with the good side down, place your glass piece on top, and cut out the portion of paper you will need, leaving some extra around the edges. Pardon the terrible lighting in these “in action” photos – sometimes trying to DO and photograph a project at the same time does not produce the best photography results! Peel off the backing about 1/4 of the way and stick it down on the glass, starting on one side. Then continue peeling the back off slowly as you smooth out bubbles with a credit card. It’s just really important to do it sloooowly and get the bubbles as you go. 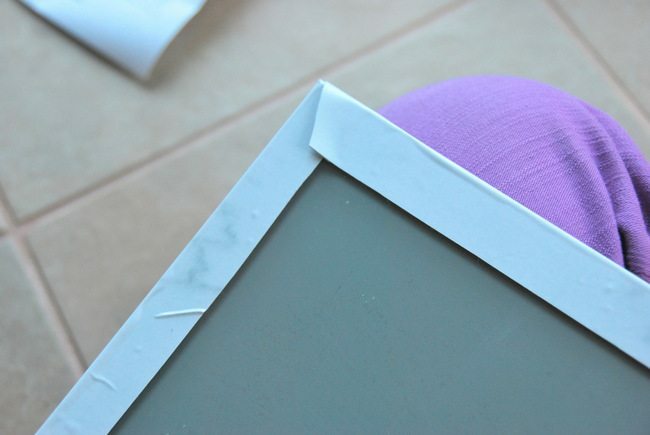 Don’t press too hard with the credit card as you don’t want to damage the paper. Once you have the whole surface done and all the bubbles smoothed away, it’ll look like this. Now it’s time to deal with the edges. I used an exacto knife to cut the corner. Then I would tightly pull the paper around and stick down along the back of the table. Then do the same with the second corner. 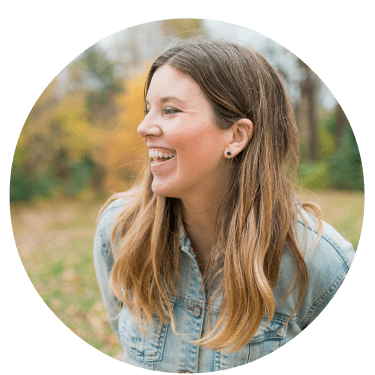 That’s the hardest part, so yay – you’re done! 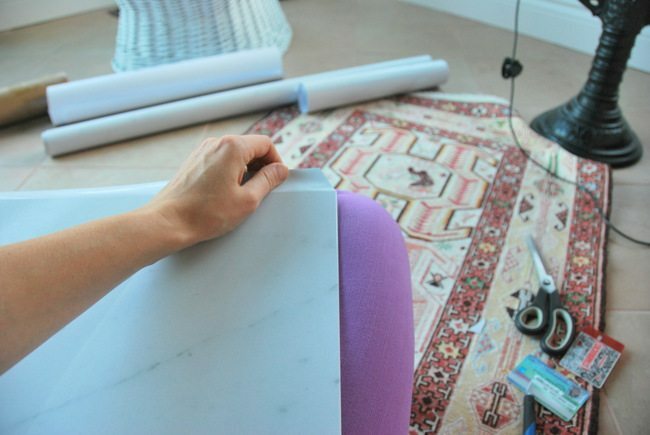 Now it’s just a matter of popping your new marble table top back into the table. And seriously, the table looks glam. People will think you shelled out big bucks. I get comments on ours ALL.THE.TIME. If the spray paint ever gets any dings, the great thing is you can easily pop the top off and freshen it up with a new coat. And if you wanted a different look, you could easily do a fun colour. I think a neon pink or bright mint would be AMAZING. 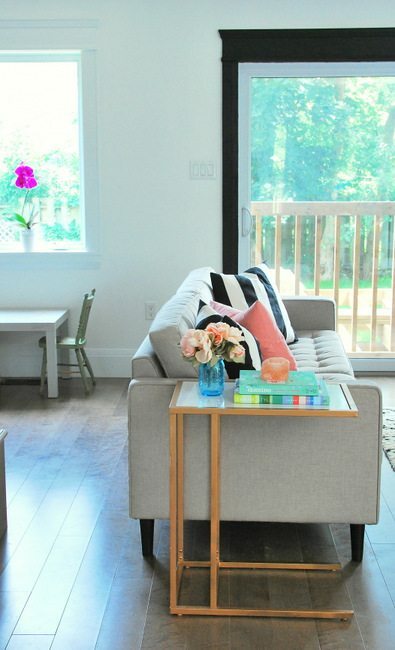 In fact, I’m pretty tempted to do a pink one myself for our future upstairs family room…. Total budget for the table was $65, but a lot of that was for the marble paper which I have leftover for future projects. What do you guys think? Fun, right? 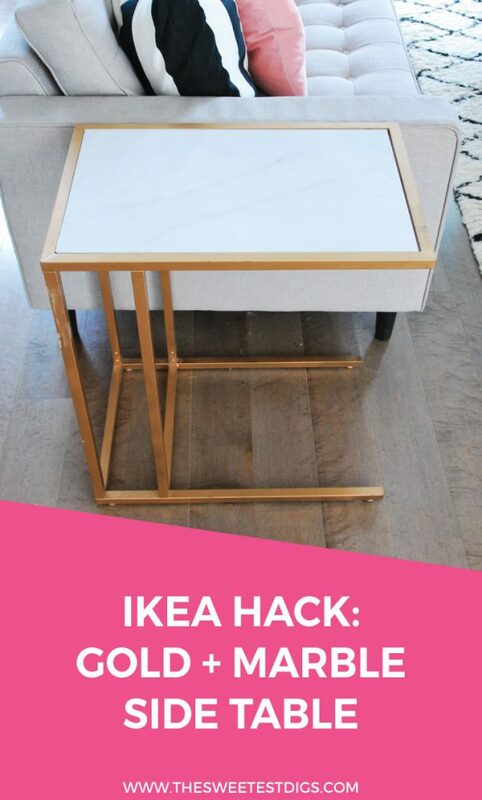 Doing any IKEA hacks yourself these days? 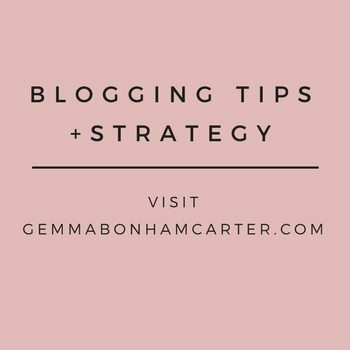 Wow, Gemma! It looks great. I don’t have a source for a canadian vendor sadly. If they are American-only I usually just order from Amazon.com and ship it to the UPS store in Ogdensburg, NY — the border is only 45 minutes from Ottawa. Saves any potential customs bills in the mail. I love the pink accent pillow on your couch! I have been looking for the right shade for mine. Where did you find it?? IKEA!! 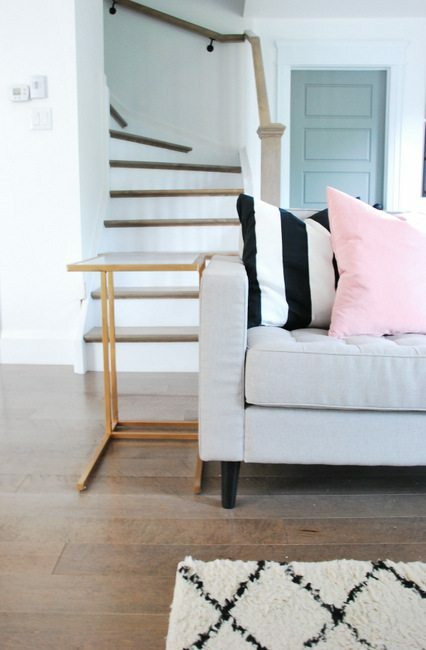 Super cheap and soooo cozy – it’s a velvet type fabric. The metal paint chips and dings easier than anything I have ever seen. Even after 4 coats and letting 24 hours go by between coats. Looks great till you actually go near it and use it. Hmmm I have had mine for more than 2 years and it still looks pretty great!! No chips at all. What spray paint did you use? I love this! 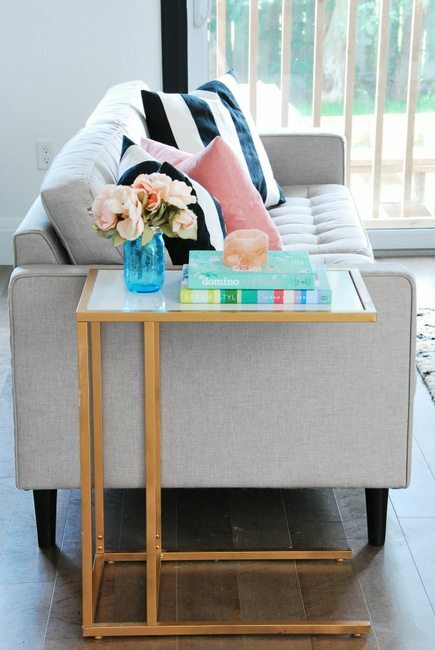 I just did an IKEA coffee table this way and was looking for side tables when I stumbled on your post. I will be running to Ikea again it looks like. I did mine in rose gold and sprayed it with a sealant to protect from scratches but I’m not too worried. Thanks for the inspiration! !